The prize is a new iced out Huncho chain. On Thursday, Quavo kicked off a brand new internet challenge in promotion of his debut solo album Quavo Huncho. The #DJTakeoffChallenge — as it is called — stems from an Instagram video uploaded by Quavo that sees Takeoff masterfully DJ'ing at a small gathering in what looks to be a dressing room. 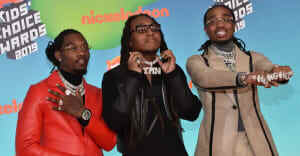 In the clip, Quavo is seen gleefully dancing to "Lose It" off of the album, while Takeoff commands everyone's attention with a skillful display of DJ'ing. Armed with a blank expression on his face, and a subtle bop of the shoulders, Takeoff seamlessly fades the track in and out, bringing it back in as the bass drops — leaving the people in the room cheering with excitement. After a number of Twitter users tried re-create Takeoff's facial expression and dj'ing ability, Quavo called on more fans to try out the challenge, and threw in an incentive: an iced out Huncho chain for the creator of the best video. "#DJTAKEOFFCHALLENGE. Best One Win HUNCHO Gang Chain!!!" Quavo wrote. As expected, a number of people have uploaded their own hilarious take on Takeoff's antics. Check out some below. Thumbnail image courtesy of Tabatha Fireman/Getty Images.